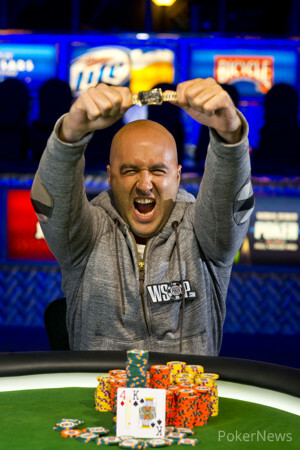 Justin Oliver has fulfilled a lifelong dream of becoming a World Series of Poker bracelet winner after taking down Event #38, the $2,500 No Limit Hold’em Four-Handed tournament. The third and final day of this exciting tournament began at 13:00 and saw eight players sit down in the vast Amazon Room, each vying for poker’s most sought after prize. Jonathan D’Souza was the first player to be eliminated and after only a handful of hands. David Pham raised to 20,000 under the gun and D’Souza called next to act. The pair shared flop, and Pham checked to D’Souza who then moved all-in with just and Pham snap-called with for bottom set. The turn and river bricked and D’Souza exited in eighth place. The eliminations kept coming with Mike DeGilio and Daniel Park exiting within the first couple of hours, leaving the five remaining players to move to “The Mothership” to make up the unofficial final table. Play remained five-handed for 90 minutes before a double elimination occurred to send the two most experienced players to the rail. Nick Schwarmann opened to 32,000 when first to act and Pham called on the button. John Juanda called in the big blind and it was three-handed to the flop. Juanda checked to Schwarmann who made it 43,000 to play. Pham called, but Juanda sat riffling chips for the best part of a minute before swallowing hard and announcing he was all-in. Schwarmann instantly called, putting the action on Pham. Pham asked if he called and lost would he finish fourth or fifth; there was a $34,000 between the two finishing positions. As Pham had a larger stack than Juanda, Pham would finish in fourth place if he called and lost. With that information processed, Pham called and we had a three-way all in! Schwarmann showed and Juanda asked Pham, "Do you have a draw too?" Pham did have a draw as he held . "Well I have the best hand, now." Juanda showed . The turn was the , a complete blank, but the river was the , completing Schwarmann and Pham's flush, Schwarmann winning huge pot with the nut flush. Next to bust was Jared Jaffee, who fell victim to the run good of Schwarmann. On Hand #19 of the official final table, Schwarmann opened to 35,000 on the button and Jaffee called. A raising war broke out on the flop that resulted in Jaffee being all in with to the of Schwarmann. Jaffee turned a third queen, but the river was the flush-completing , busting Jaffee and leaving Schwarmann to take an almost 6-to-1 chip lead into heads up. It took 125 hands of one-on-one play for the tournament to be decided, during which time Oliver doubled up twice before losing ground once again. On the 105th hand of heads-up, all the chips went into the middle with Oliver holding to Schwarmann’s . The queens held and Oliver soared into 2,515,000 to 1,100,000 chip lead; it was a turning point in the mtch. Twenty hands later and it was all over. Oliver raised to 60,000 and Schwarmann three-bet to 175,000. Oliver then four-bet to 350,000 and Schwarmann called. Both players then checked the board, leading the dealer to put the onto the turn. Again, both players checked. The river was the and Schwarmann moved all in, Oliver called and tabled for top pair while Schwarmann could only muster the for a missed draw. Oliver ran to his girlfriend and dog on the rail saying, “WTF just happened?” His girlfriend later telling friends Oliver had wanted to win a WSOP event for so long. Now he has done that, congratulations from all the PokerNews team. 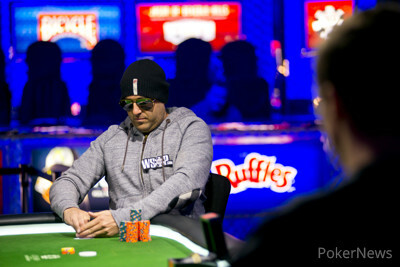 That wraps up our coverage of Event #38, keep your browsers locked to PokerNews.com for the rest of the 2013 WSOP and beyond as we bring you all the action from all of the events. 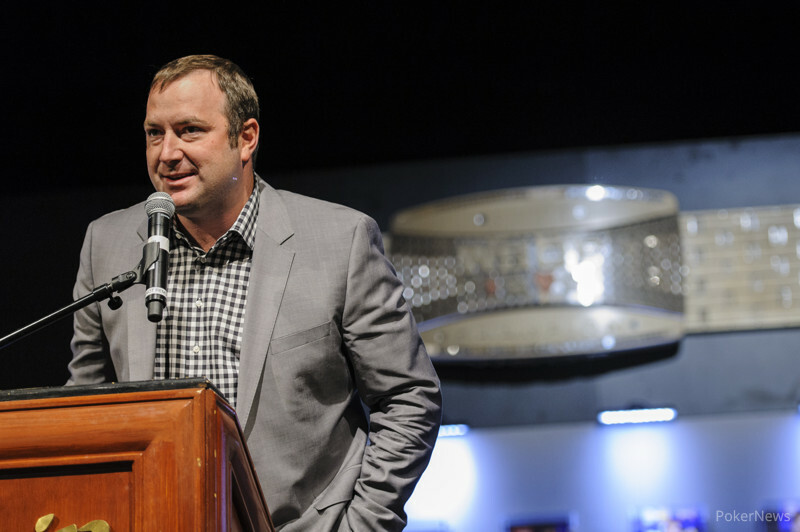 Following the pattern of the last few hands, Oliver raised to 60,000 and Schwarmann reraised to 175,000. Oliver reraised to 350,000 and Schwarmann called. Schwarmann checked the flop and Oliver checked behind. Both players check the turn. Schwarmann moved all in on the river and Oliver called. Schwarmann tabled for a missed draw and Oliver showed for a pair of kings which was good enough to eliminate Schwarmann in second place. Hand #112: Nick Schwarmann raised to 75,000 and Oliver made the call. Oliver checked the flop and Schwarmann bet 125,000. Oliver made the call and checked the turn. Schwarmann bet 300,000 and Oliver folded to the pressure. Hand #113: Oliver raised to 60,000 and Schwarmann reraised to 175,000. Oliver folded and Schwarmann took the pot. Hand #144: Schwarmann raised to 75,000 and Oliver called. Oliver and Schwarmann bets 125,000. Oliver called and checked the turn. Schwarmann bet 300,00 and Oliver folded. Poker Game Tight? What About Your Life Game? Sarah talks to poker players to get them to open up about their leaks, not their poker leaks, their life leaks of course. 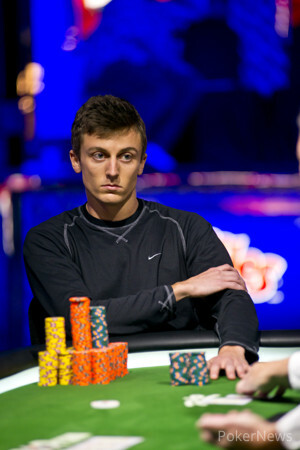 Hand #106: Nick Schwarmann opened to 50,000 and Justin Oliver folded. Hand #107: Oliver made it 50,000 to play and Schwarmann three-bet to 150,000. Oliver paused for the count of 25 before taking back his original bet and replacing it with 300,000 worth of chips. Schulmann quickly folded. Hand #108: Schwarmann took down the pot with a raise to 50,000. Hand #109: Oliver limped for 30,000 only to see Schwarmann raise to 120,000, forcing a fold from Oliver. Hand #110: Schwarmann gave Oliver a walk. Hand #111: Oliver raised to 60,000 and Schwarmann folded. Hand #103: Oliver completed the small blind and Schwarmann checked his option. Schwarmann led for 40,000 on the flop and Oliver called. Schwarmann bet 50,000 on the turn and Oliver folded. Hand #104: Schwarmann raised to 50,000 and Oliver folded. Hand #105: Oliver raised to 50,000 and Schwarmann reraised to 150,000. Oliver reraised to 300,000 and Schwarmann moved all in. Oliver called with as dominated Schwarmann's . The board ran out and Oliver doubled up again. Hand 99: Justin Oliver gave Nick Schwarmann a walk. Hand 100: Schwarmann opened to 50,000 on the button and Oliver three-bet to 150,000 and it was enough to win the pot. Hand 101: Oliver made it 50,000 to go, Schwarmann three-bet to 150,000 and Oliver four-bet to 275,000 and Schwarmann called! The flop came down and both players checked. The turn brought the into play. Schwarmann bet 450,000 and Oliver instantly folded. Hand 102: Schwarmann raised to 50,000 and Oliver called,. The flop read and Oliver checked, Schwarmann bet 50,000 and Oliver called. The turn was the , Oliver checked, Schwarmann bet 100,000 and Oliver called again. The fifth community card was the , Oliver checked, Schwarmann bet 350,000 and Oliver at back in his chair, podered his options for the best par of a minute before settling on folding. Hand #94: Nick Schwarmann raised to 50,000 and Justin Oliver folded. Hand #95: Oliver folded and gave Schwarmann a walk. Hand #96: Schwarmann raised to 50,000 and Oliver called. Oliver check-folded the flop to Schwarmann's bet of 50,000. Hand #97: Oliver completes the small blind and Schwarmann used his option to raise to 100,000. Oliver made the call and the flop was dealt. Schwarmann bet 100,000 and Oliver reraised to 250,000. Schwarmann folded and Oliver won the pot. Hand #98: Schwarmann raised to 50,000 and Oliver called. Oliver check-folded the flop to Schwarmann's 50,000 bet. Welcome to Day 3 of Event #38: $2,500 No-Limit Hold'em (Four Handed)!